The footing that's about to be poured for this house will rest on a boulder as well as on regular soil. Over time, the soil will settle, and the boulder will not. Differential settlement will eventually result. Because of the geology, the topography of some of our area consists of moderate to steeply sloping, wooded hillsides, which generally have a shallow bedrock depth- this is especially true in areas where numerous boulders or bedrock pinnacles outcrop the ground surface. House construction in this type of terrain usually requires extensive land clearing and the addition of fill soil to provide a level pad or acceptable base on which to construct footings and foundation walls. Moreover, because of the ground slope, houses are often constructed on crawl space foundations, which bear on footings that stair-step "up and down" the natural and/or "artificially created" grade. Many times the footings are founded partly on rock and partly on soil. If the soil-supported footings settle and the rock-supported footings do not, a differential settlement can occur. Differential settlements are frequently the cause of foundation wall and brick veneer cracking; they are exemplified by stair-step crack patterns and/or crack patterns which indicate rotation or pivoting of the footings about a central point. The crack shown here is a result of improperly compacted fill soil. Foundation settlements can also occur whenever the bearing pressure of the foundation footing exceeds the strength of the supporting soil, or whenever the supporting soils are imported fill soils that have not been properly compacted. 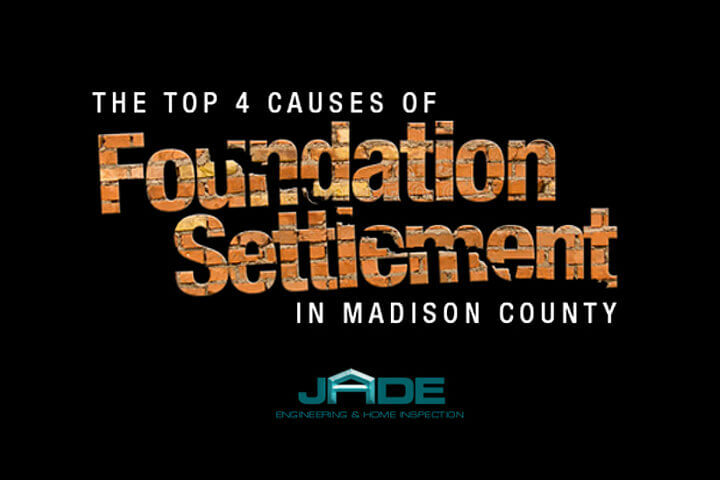 Foundation settlement also occurs when the underlying soils include mixed organics (vegetation) that decays over time (it is not unusual for foundations to rest on large tree stumps or root systems that were cut to the ground level or above ancient buried trash pits full of organic materials). These are the types of settlements that occur on mountaintops and in the valleys or open fields. The crack shown in this photo results from continual shrinkage and swelling of highly plastic soil that the home was founded upon. The best case scenario would have been for the builder to have removed the plastic soil and bring in compactible soil before the foundation was laid. ￼The crack shown in this photo results from continual shrinkage and swelling of highly plastic soil that the home was founded upon. The best case scenario would have been for the builder to have removed the plastic soil and bring in compactible soil before the foundation was laid. Another common cause of foundation settlement or what should be called "seasonal foundation movement" in our area is associated with the physical nature of the underlying subgrade soils. These soils are usually residual clays that have evolved from the weathering of limestone bedrock. They are the tan-orange-gray, sticky, clay-soils. Geotechnical engineers classify these soils as "highly plastic" since they remain plastic (or moldable) over a wide range of moisture contents. Highly plastic soils physically shrink in volume whenever they dry or desiccate, and swell in volume whenever they become wet. Much like a household sponge behaves. Inevitably, during the dry summer months, and especially during extended droughts, shallow-bearing foundations tend to settle, causing cracks in foundations and brick veneer and possibly interior drywall; during the wet winter months the cracks often close and disappear as the soils swell. This movement can cause doors and windows to stick in some seasons, and cracks to form in brick veneer, concrete block and drywall that open/close throughout the year. Proper site drainage is imperative in this geologic/topographic setting because it's important to ensure that the subsoils maintain as close as a uniform moisture content as possible throughout the year. If water stands or collects in low lying areas near foundation walls, the subgrade soils can become and/or remain saturated even as adjacent soils dry, thus creating a differential soil moisture and subsequent differential foundation movement. Regardless of the cause, the potential for long-term differential foundation settlement is very good in our area. Thus, in new house construction, it is imperative that the footings be located on stiff underlying subgrade soils, preferably deep in the ground and/or on bedrock, or below the seasonal drying penetration, and that proper drainage be provided to prevent water from standing and soaking into the ground around the home (saturating the supporting subgrade soils). Of equal concern is water that flows harmfully alongside the foundation walls; it can lead to erosion undermining. So what is the solution to foundation problems? It all depends on the amount of distortion. If the corner of a home settles as little as1/4 - 1/2 inch, it can create cracks in brittle drywall, concrete block and brick veneer. However, the wood frame superstructure, sitting on the foundation, can care less about this little bitty movement. In this case, nothing needs to be done structurally. The cracks in the drywall, brick and block can be cosmetically-repaired. Or the cracks can be left alone as they typically cause no problem if left open. Also, making a cosmetic repair in brick veneer with a contrasting mortar color can stand out like a sore thumb. Hence, leaving the cracks alone is often the best bet. If, on the other hand, the foundation settles three inches, and the windows and doors become bound shut or won't operate, then there will surely be interior drywall cracks and health/safety concerns such as inadequate egress during a fire or some monstrous Act of God. In this case, it may be prudent to underpin the foundation with deep-drilled concrete piers or steel-pipe, helical piers and level the foundation to make the windows/doors operable. 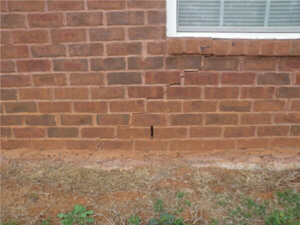 There are a host of foundation repair companies that perform this type of repair. 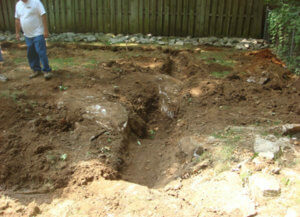 The best way to determine when a foundation repair is needed, is to perform a floor level survey inside the home. This entails mapping out the interior floor plan and then measuring the floor elevations with a manometer (water level). If this is not done, then no one can state how much distortion has taken place. Is it ¼-inch or is it 3-inches? 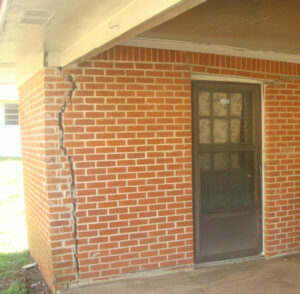 This must be determined before a foundation repair is considered. This is especially true because foundation repairs are very expensive-usually costing $ 5,000.00 or more. A floor plan and level survey by an engineer may cost $ 600.00 or more, but the information garnered from this study is worth its weight in gold. Moreover, the engineer can develop a repair plan that can be given to several contractors to ensure that all bid on the same scope of work. It has been our experience that 90% or more of the homes having cracks in their drywall, foundations and brick veneer do not need expensive foundation/structural repairs. This is because these materials are very brittle and cannot withstand the slightest amount of stress/strain without cracking to relive the stress/strain. And most of the crack-free home's we've inspected have floor level variations across their foot-print of one-inch or more, including brand new homes, so differential settlements of less than one inch seldom cause cracking. A good rule of thumb when considering foundation repair, is that if there are no drywall cracks opposite the brick veneer cracks or above the foundation cracks, there is a high probability that no foundation repair is needed. Drywall is more resilient than brick veneer and when it develops large cracks, it is usually a sign of significant building distortion. Narrow cracks often develop due to changes in temperature/humidity and wood-framing moisture contents. Call TODAY to setup an appointment for a Home Inspection or Engineering Inspection by JADE or Contact Us today!